(1:26)And God said, Let us make man in our image, after our likeness: and let them have dominion over the fish of the sea, and over the fowl of the air, and over the cattle, and over all the earth, and over every creeping thing that creepeth upon the earth. (1:27) So God created man in his own image, in the image of God created he him; male and female created he them. (2:7) And the LORD God formed man of the dust of the ground, and breathed into his nostrils the breath of life; and man became a living soul. (2:8) And the LORD God planted a garden eastward in Eden; and there he put the man whom he had formed. [...] (2:20) And Adam gave names to all cattle, and to the fowl of the air, and to every beast of the field; but for Adam there was not found an help meet for him. (2:21) And the LORD God caused a deep sleep to fall upon Adam, and he slept: and he took one of his ribs, and closed up the flesh instead thereof; (2:22) And the rib, which the LORD God had taken from man, made he a woman, and brought her unto the man. (2:23) And Adam said, This is now bone of my bones, and flesh of my flesh: she shall be called Woman, because she was taken out of Man. This is really fascinating. It's an interesting exercise to compare creation stories between religions. I have to admit, I'm only familiar - and then only in passing - with the Christian creation story, and since the Bible's been translated to death unless you read the original Hebrew it's hard to tell how accurate any one translation really is - how true it is to the original. Given that a large chunk of my genealogy is Scandinavian, the Norse mythology is particularly interesting to me. Thanks for a fun and informative post! Another fascinating post, Amalia. Whenever I read creation myths, I'm left wondering why we care so much about where we came from when we should be focused on where we're going. There seems to be way too much effort spent in making the myths correspond to what we know about the scientific evolution of our world. The party line is that we study these stories so we can learn from our (and the gods') mistakes. But regardless of the myth, Adam and Even or Ymir's armpit sweat, there's no evidence we've learned a thing. Sorry, some days I just can't keep the sociologist in me at bay. I'm working hard to overcome. BTW, I adore Rubens, and this painting always makes me smile. 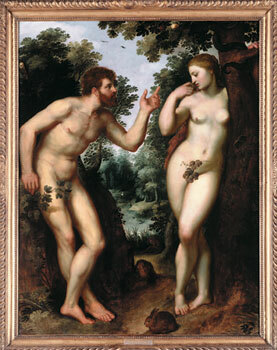 It's like you could put Adam and Eve in a bar, throw some clothes on them and they'd look totally 21st century. Mara: I'm glad you enjoyed the post! I know exactly how you feel with the bible-- I have a great translation of the old testament from the Hebrew which I usually rely on, and a translation of the New Testament from the Septuagint where they omitted all the verse numbers and just wrote it like an actual book, an actual collection of stories, which I LOVE. But I read the bible for the myths more than anything else. Fascinating stories! VR: That's an interesting thought. I'm not sure that I actually read myths to learn from anyone's mistakes. I see it more as man's attempt to make the world something comfortable and safe. I think that's why we have to understand it-- even if it is just through metaphor, story, parable-- because otherwise it's really quite terrifying. This way we can put the things we don't understand into a context that is much more reassuring, and find the loopholes to control it. I think that's what gods really function as-- controls, scapegoats. So that when something terrible happens, there is something to blame, or something that can at least be DONE so that we don't feel so helpless in the face of it. We can appeal to a god! We can blame a god! We can try to make the god turn the world in our favor through sacrifice and prayer! These are the rules, and so now we can manipulate them to work in our favor. Maybe I just look at things weirdly? In a very real way, I think we're talking about the same thing. By learning from others mistakes, we can avoid earlier mistakes, understand the world, and therefore be safe, or safe and comfortable, as you say. Interesting comparison here. I think it's fascinating to see the same stories recur in different cultures. This isn't really the same, but I've always thought it was interesting that lots of different, semi-isolated cultures had stories about "dragons" or dinosaurs. Makes you wonder if they'd seen them. On a tangent: Your post comparing creation stories makes me think of how different cultures have similar fairy tales. I'm thinking specifically of Sleeping Beauty, and how in the Norse version the princess dresses in battle armor and lies in an enchanted sleep, waiting for a worthy companion. After your reference to the Judeo-Christina Noah's Ark versus the Norse drowning-in-blood, it just made me think on all these stories, similar, yet different. And yeah, you are by far the most expert person on the biblical creation story I know!